I am now in search of the rumored neighborhood coin laundry. Google Street View found an empty building where the hotel flyer says there should be a coin laundry, but this doesn’t surprise me since the Google Car has probably been down this street exactly once in the past decade and stores come and go overnight in Japan. 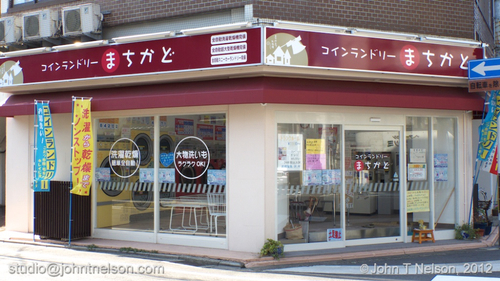 [ I later learn that the coin laundry opened in March of this year ]. As I walk up the street I see we have a Daily Yamazki on the corner, where I pick up a vitamin drink and onigiri for breakfast. Not more than five minutes later I find a 7-eleven where Google Street View showed another empty office building. Another five minutes down a cross street I find the fabled coin laundry where Google Street View showed only empty space! I also now have a five minute, as opposed to 20 minute, walk to the nearest 7-Eleven! Note the coin laundry hours of operation: 6:00am – 12:00noon.